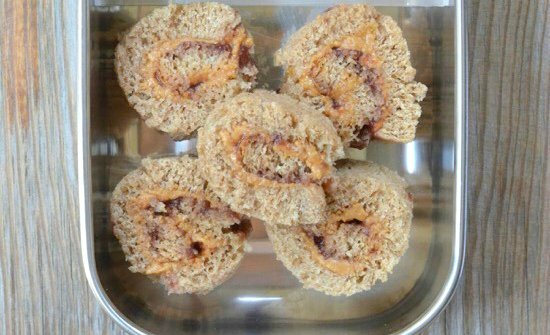 Most kids love Peanut Butter & Jelly (or, in the case of my daughters, Peanut Butter & Honey) sandwiches, and rolling it up like sushi is an easy way to change it from a lunch sandwich into a fun, portable snack. In case you’ve never tried it, cheese is one of the many foods that can be frozen with no negative consequences. It’s one of the best kept secrets when you’ve got a long travel day (or hot day at the pool) ahead of you because it will last for hours until you’re ready to dig in. Wasn’t sure if it would work, but I recently packed homemade frozen yogurt pops in my cooler for the pool (along with several ice packs, of course! ), and they held up beautifully. 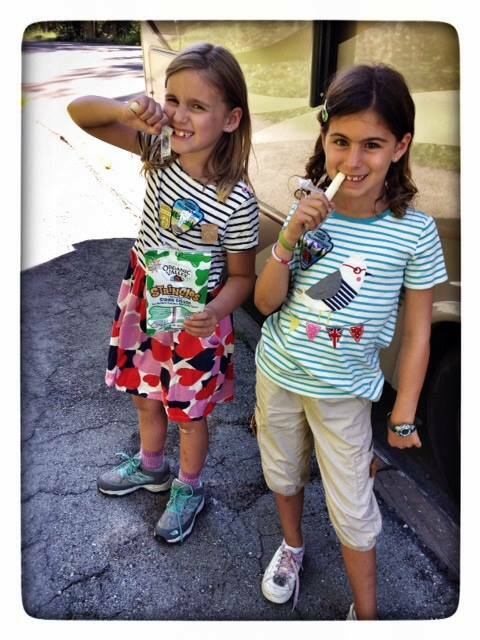 I gave it to my daughters and their friends about an hour after we arrived, and we had no leakage or other issues at all. 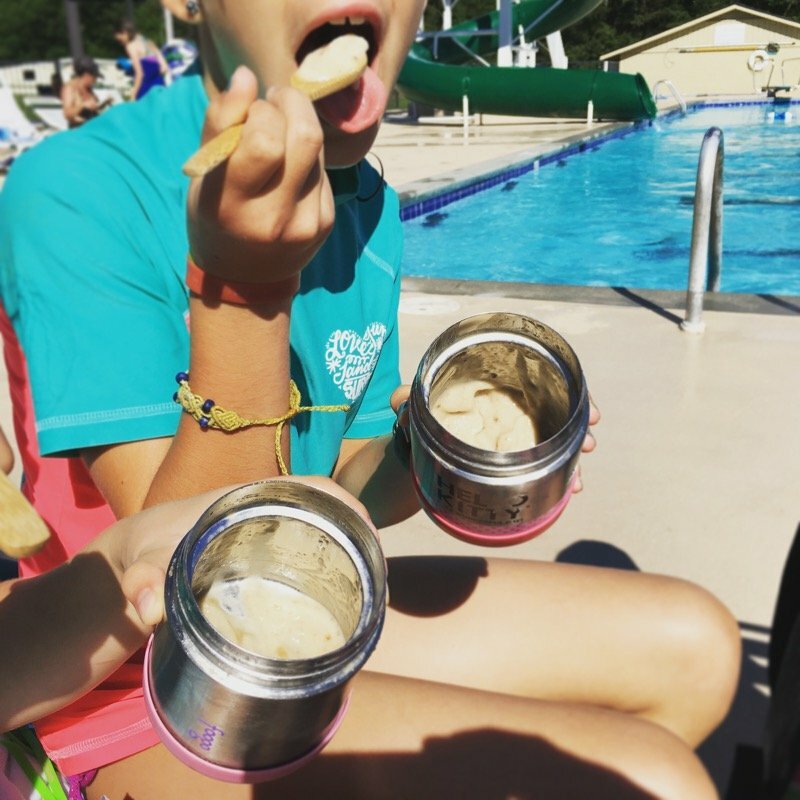 I love knowing another yummy homemade snack that can be portable on a hot summer day – anything to keep their eyes off the pool snack bar! 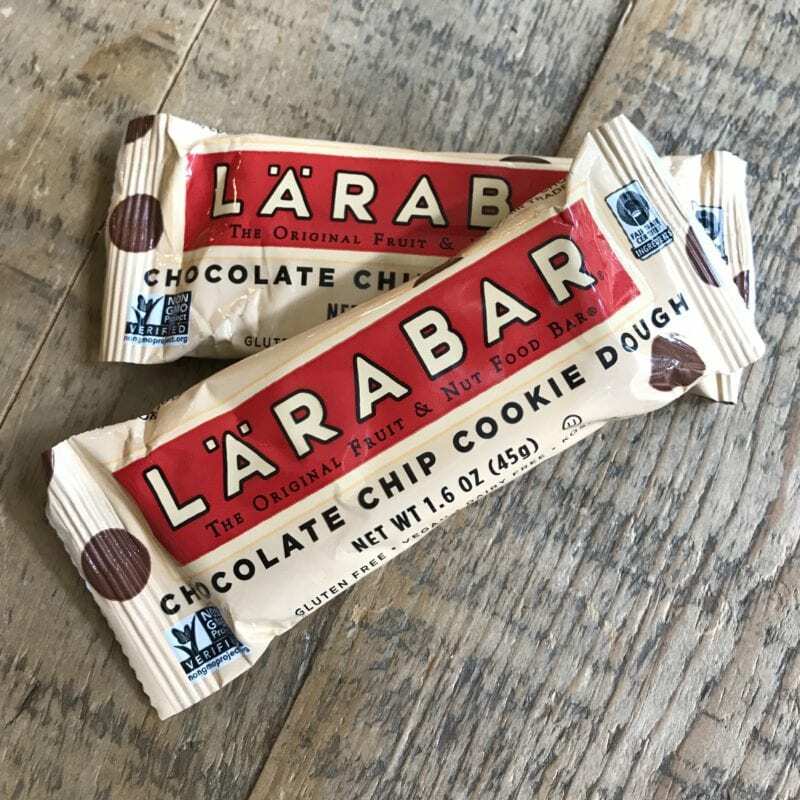 I’m a Cashew Cookie girl myself, but my daughters have both recently become big fans of the Chocolate Chip Cookie Dough LARABARs (a long time sponsor of ours!). Since this flavor contains chocolate chips it does have a small amount of added sugar, and since my daughters are both pretty picky when it comes to snack bars that I’ll actually buy, these have been a big winner at our house this summer. 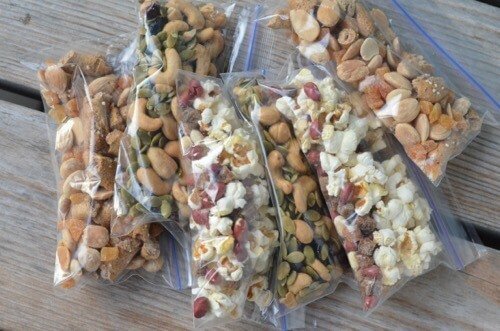 Trail mix is no new concept, but we do love to keep things interesting with our own homemade versions. Some of my favorite things to add are popcorn, roasted pumpkin seeds, dried apricots (chopped), and even broken up pieces of whole-grain crackers. Be creative and it will never get boring! 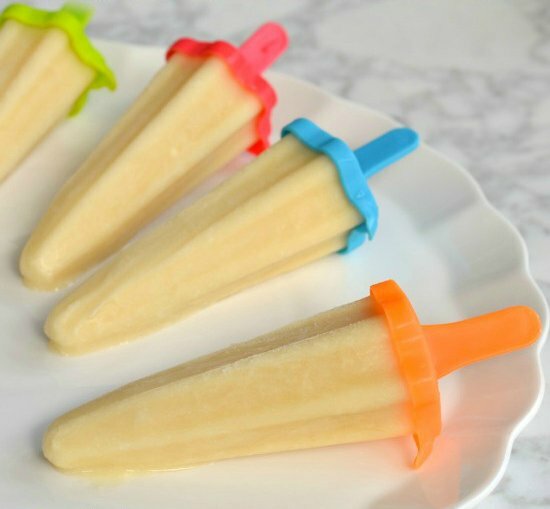 There are a thousand different smoothie recipes out there and one of our favorite things to do is freeze them in silicone ice pop molds. 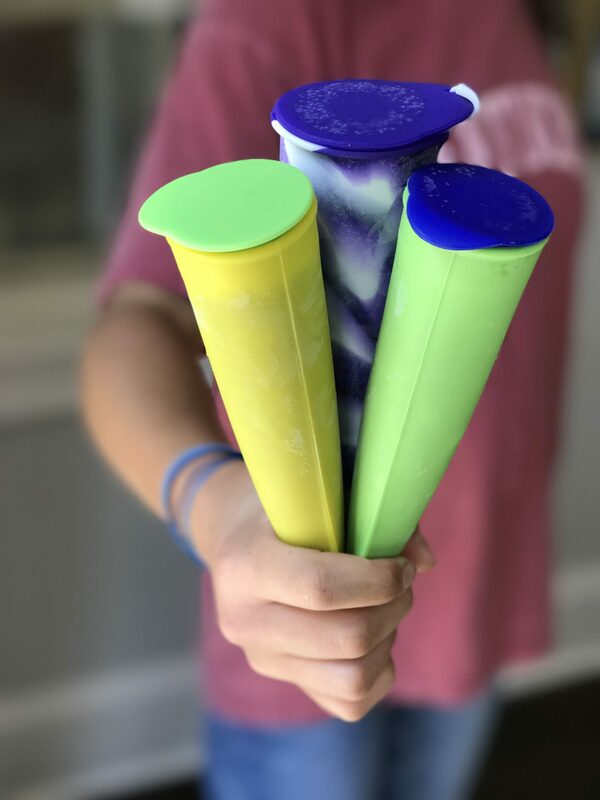 Simply blend together your favorite fruits, greens, liquids and nut butters, and pour them into ice pop molds to freeze so you’ll have a portable good-for-you snack to grab and go next time you head out the door. It’s hard to go wrong with watermelon and I’ve got say – this one truly is a crowd pleaser. So, especially if I know I am feeding kids other than my own, this is a go-to summer snack of ours whether at the pool or at home! My daughter and I had the chance to share our snack ideas on our local Charlotte Today show this week. Here is the clip if you want to check out the video! Great post and ideas! Super TV spot too. Love your dress (or shirt?) – would love to know where you bought it/brand. Thanks! I got it at Loft and have already worn it so many times this summer! I saw your suggestion of watermelon, and it reminded me of a recipe I saw for frozen watermelon last summer, but never got around to trying. Basically impale a trianglular watermelon slice with a popsicle stick and freeze, then eat it like a popsicle. I plan to finally try it. Also, to save money, I make my own Lara bar balls using a cookie scoop and freeze till needed. I bet they would be good cold. I’ve seen pics of those watermelon pops, but did not realize they were frozen. Interesting! These are great ideas! 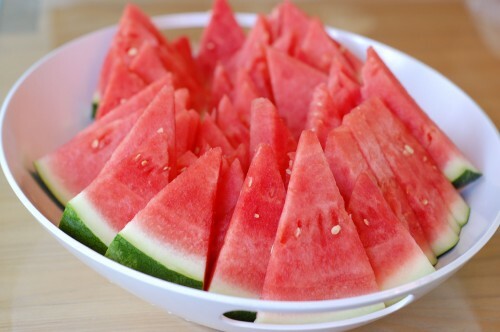 My favorite is the watermelon–100% summer! I recently saw a great way to cut it so you get long, easy to wield épées of watermelon. Where are the recipes for the yogurt pops and smoothie pops? Hi. Here ya go: https://www.100daysofrealfood.com/recipe-orange-creamsicle-yogurt-pops/ and you could use any smoothie recipe such as thei one: https://www.100daysofrealfood.com/peachy-pineapple-green-smoothie-recipe/. what a wonderful list! Thank you for all of these, so many great healthy ideas, love the banana ice cream, custom made popsicles and trail mix, even frozen cheese sticks! wow! Very informative article..Banana Ice Cream is my best Summer Snacks.It is very beneficially in summer. I really enjoyed it.. There is nothing better than the frozen smoothie pops if you ask me, The kiddos loved it. Thank you for sharing with us.